Joe is a 75-year-old Indonesian from Medan. Sometime in 2010 he suffered from heart problems and was on a blood-thinner drug. Then in September 2013 he was severely jaundiced. 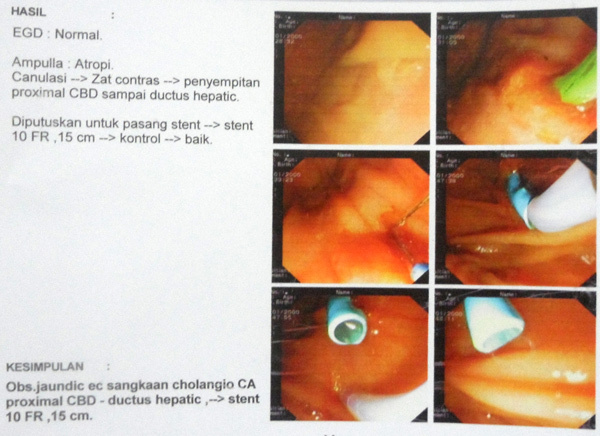 The doctor in Medan inserted a biliary (plastic) stent into the left hepatic duct and CBD. Two weeks after this procedure his blood pressured dropped drastically. Both his arms and legs and abdomen were swollen. He was semi-unconcious and was unable to walk. Laid on a stretcher, his family flew him to Penang. This medical emergency trip on Sriwijaya Air cost he family RM 8,000 (the normal flight ticket is about RM 150 to RM 200). Lesions scattered in the liver ranging from 0.5 to 1.8 cm in size, suspicious of metastatic deposits. There was a lobulated irregular mass at the portal of the liver measuring 3.5 x 3.9 x 5.6 cm. It has infiltrated the portal of the liver. Enhancing soft tissue lesions in the right subdiphragmatic, right subhepatic, around the right kidney, crus of both diaphragms with encasement of the vessels anterior to the aorta. Right kidney was displaced anteriorly. Impression: Features are suggestive of advanced cholagiocarcinoma with local infiltration and liver metastasis. Joe underwent an endoscopic retrograde cholangio-pancreaticogram (ERCP). The plastic stent, previously installed in Medan, was removed and an self expandible metallic biliary stent was inserted into the left intrahepatic ducts. Joe remained in the hospital for 2 weeks and his conditions improved. All swellings and jaundice were gone. The treatment in the hospital cost him about RM 16,000. Joe was asked to undergo chemotherapy. With chemo his life would be prolonged (no months mentioned) but without chemo the doctor said he would not last more than 3 months. The family refused chemotherapy and his two sons (without the patient) came to seek out help on 20 September 2013. Joe was started on herbs. After 2 months on the herbs, we were told that Joe was doing very well, in spite of not undergoing chemotherapy! His appetite had improved and he was more energetic. The family did not tell Joe that he had cancer! In February 2015, one of Joe’s son came to our centre. Listen to our conversation. Installation of stent in bilary duct and started on CA Care herbs on 20 Sept 2013. No chemo. 5 Feb 2015 Blood test: Low in Sodium, Albumin and Haemoglobin. Ask to go for transfusion. This entry was posted in Bile Duct Cancer (cholangiocarcinoma) and tagged bile duct cancer, CA Care Therapy, herbal therapy, liver metastatis by CA Care. Bookmark the permalink.